A sweat gland is a small gland in the skin of a human or other mammal that secretes a salty fluid solution (sweat). Excess body heat causes the sweat to evaporate, which cools the skin and the blood passing through capillaries close to the skin surface. Sweat glands extract water, salts, and urea from the capillaries that supply them and excrete them as sweat. The process is under control of the autonomic nervous system, and forms an important part of the body's temperature control system (see homeostasis). 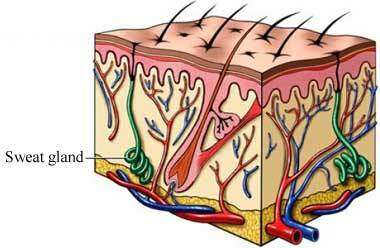 Sweat glands are formed from the epidermis but project deep into the dermis. They occur over most of the body surface in humans and other higher primates but have a more limited distribution in other mammals. Dogs, for example, have very few sweat glands, and those mostly on the pads of the feet. Sweat evaporates most rapidly when the outside air is warm and dry, and when it is windy. Excessive sweating must be compensated for by increased intake of water and salt. Swaeting may also increase in response to anxiety or stress.